KidLogger - is software for monitoring user activity on the computer or phone, which includes a parental control tool. The functionality of the program allows using it in different areas of life, from child-rearing to adjust your own discipline. But let's look at all the possibilities of KidLogger app. We know the importance for each parent to know what their children do while staying alone. That is why the program KidLogger includes function of monitoring user activity on the computer and the phone. Now you can easily keep track of your children while they using the computer and get to know what games they are playing in, which sites they are visiting, etc. The program works automatically and does not require the intervention of parents in the process. What kind of pictures were taken by telephone. Get all the information above, you can see the overall picture of your child's life in the network and to take measures in time, if you have something to guard. You've probably already heard about cyberbulling - varieties of children's aggression on the Internet. KidLogger program allows track and prevent such pressure on your child in time. The app records the user activity log onto your computer and phone. Then all the data is sent to Kidlogger.net the server where you will be able to check all the messages and calls that addressed to your child. This feature allows you to find a negative communication, to prevent the development of correspondence with strangers and to ensure the safety for your children even when you are not around. KidLogger Parental Time Control – is a special application that allows you to set time limits on the use of any programs and applications. The schedule function allows your child not to distract on games and Internet during school time. To activate it, simply set the time lock and select the applications that should be banned in school hours or in the evening. Also parental time control is necessary if your child suffers from gambling or Internet Addiction, but you cannot completely limit the access to a computer or a phone. Set the schedule to access the games and the Internet, you teach your children discipline and plant a habit to distinguish between work and leisure time. KidLogger Service allows you to control what your children do on the Internet, even if they use the iPhone or iPad. Our parental control software for iOS allows you to receive all the necessary information, but it does not require the installation of applications on the iPhone. Learn more about monitoring for iOS can be found here. KidLogger regularly records the coordinates of the laptop and phone and making out on the map, you can see it in your account on our site. With this feature, you can easily find out where was your child during the day. Also it can help in case of lost or stolen phone or tablet. KidLogger allows you to record all conversations and voice around the computer. However, recording is automatically activated only at a certain volume level of sounds around the computer. Check the current coordinates of the phone. 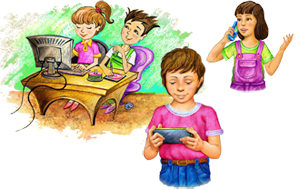 KidLogger program is designed to help in the protection and education of your children.